Ubisoft - Lead a team of elite agents into a post-pandemic Washington, DC, to restore order and prevent the collapse of the city. The fate of the free world is on the line in Tom Clancy’s The Division 2. Content and system requirements pending; check all requirements/details/restrictions prior to purchase/redemption. Minimum – 1080p | 30 fps os: windows 7 | 8 | 10 cpu: amd fx-6350 | intel core i5-2500k ram: 8 gm gpu: amd radeon r9 270 | nvidia geforce gtx 670 vram: 2 gb direct x: directx 11 | 12 recommended – 1080p | 60 fps os: windows 7 | 8 | 10 cpu: amd ryzen 5 1500x | intel core i7-4790 ram: 8 gb gpu: amd rx 480 | nvidia geforce gtx 970 vram: 4 gb direct x: directx 11 | 12 high – 1440p | 60 fps os: windows 7 | 8 | 10 cpu: amd ryzen 7 1700 | intel core i7-6700k ram: 16 gb gpu: amd rx vega 56 | nvidia geforce gtx 1070 vram: 8 gb direct x: directx 11 | 12 elite – 4k | 60 fps os: windows 7 | 8 | 10 cpu: amd ryzen 7 2700x | intel core i9-7900x ram: 16 gb gpu: amd radeon vii | nvidia geforce rtx 2080 ti vram: 11 gb direct x: directx 11 | 12 **supported cpus at time of release: intel 2ndgen: intel core i5-2500k or better intel 3rdgen: intel core i5-3330 or better intel 4thgen: intel core i3-4350 or better intel 6thgen: intel core i3-6100 or better intel 7thgen: intel core i3-7100 or better intel 8thgen: intel core i3-8100 or better AMD FX series: AMD FX-6350 or better AMD Ryzen series: Ryzen 3 1200 or better *Supported GPU cards at time of release: GeForce GTX600 series: GeForce GTX670 or better GeForce GTX700 series: GeForce GTX760 or better GeForce GTX900 series: GeForce GTX950 or better GeForce GTX10-Series: GeForce GTX1050 or better GeForce RTX20-Series: GeForce RTX2070 or better Radeon 200 series: Radeon R9 270 or better Radeon 300/Fury X series: Radeon R9 380 or better Radeon 400 series: Radeon RX 460 or better Radeon Vega series: RX Vega 56 or better Radeon VII series Important note: Series or models of CPUs/GPUs not covered by the list above, are not officially supported and may not be able to run the game at all or in optimal conditions, due to technical limitations. Tom Clancy's The Division 2 Online Game Code - . Promotional offer. Terms and conditions strictly apply and will be communicated at a later date, as determined by Ubisoft. Subject to availability and while supplies last. Electronic Arts 1068991-PCD - Ski down norwegian mountains as you battle for control of nuclear weapon supply lines, join the frontline with the French colonial troops, or go behind enemy lines in North Africa with a band of misfits sent to create mayhem. Take on physical, all-out multiplayer with your squad in modes like the vast Grand Operations and the cooperative Combined Arms, or witness human drama set against global combat in the single player War Stories. Special assignments starting on launch week, earn rewards and get an edge over the competition by completing Special Assignments. Take on classic modes like Conquest or squad up with friends in the cooperative Combined Arms. Paratrooper outfit at launch, choose one of eight Special Soldier Sets available in Battlefield V and customize your troops. Battlefield V Online Game Code - Play untold war stories – Witness human drama set against global combat in the single player War Stories. 64-player multiplayer in the chaos of all-Out War – Lead your Company in all-out multiplayer with new experiences like the massive Grand Operations mode. Immediate access to five battlefield 1 weapons* Ready for use in Battlefield 1, unlock five of the Great War’s most modern weapons and bridge the technological gap between the two world wars. Be one of the first on the frontlines and witness Battlefield – and WW2 – as you’ve never seen it before. Pre-order battlefield v and get the Enlister Offer which gives you early access to the Battlefield V Open Beta. The most physical battlefield yet – Maneuver through the battlefield using a new soldier move set, fortifications, and mobile tools of destruction. Ubisoft - Terms and conditions strictly apply and will be communicated at a later date, as determined by Ubisoft. Content and system requirements pending; check all requirements/details/restrictions prior to purchase/redemption. Promotional offer. World war 2 as you've never seen it before - Take the fight to unexpected but crucial moments of the war, as Battlefield goes back to where it all began. 64-player multiplayer in the chaos of all-Out War - Lead your Company in all-out multiplayer with new experiences like the massive Grand Operations mode. The most physical battlefield yet - Maneuver through the battlefield using a new soldier move set, fortifications, and mobile tools of destruction. Play untold war stories - Witness human drama set against global combat in the single player War Stories. 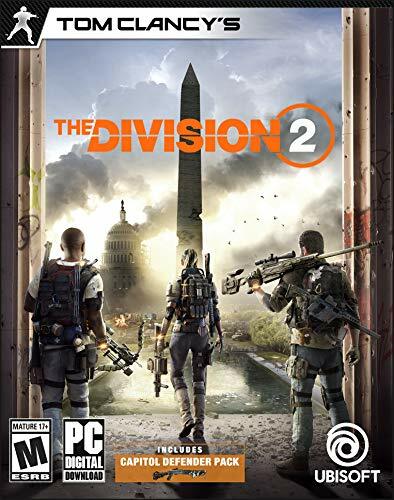 PS4 Digital Code - Tom Clancy's The Division 2 - Tom clancy's the division 2 is an online action-shooter RPG experience, where exploration and player progression are essential. Save a country on the brink of collapse as you explore an open, and hostile world in Washington, dynamic, DC. Fight together with your friends in online co-op or against others in competitive PvP. Choose a unique class specialization to take on the toughest challenges with friends in a genre-defining endgame. Want more? upgrade to the gold edition, featuring a Year 1 Pass with additional digital content and three-day early access to the game. Ubisoft - World war 2 as you've never seen it before - Take the fight to unexpected but crucial moments of the war, as Battlefield goes back to where it all began. 64-player multiplayer in the chaos of all-Out War - Lead your Company in all-out multiplayer with new experiences like the massive Grand Operations mode. The most physical battlefield yet - Maneuver through the battlefield using a new soldier move set, fortifications, and mobile tools of destruction. Play untold war stories - Witness human drama set against global combat in the single player War Stories. Tom clancy's the division 2 is an online action-shooter RPG experience, where exploration and player progression are essential. Tom Clancy's The Division 2 Gold Edition Online Game Code - Want more? upgrade to the gold edition, featuring a Year 1 Pass with additional digital content and three-day early access to the game. The gold edition includes the base game, Year 1 Pass, and three-day early access to the game. Tom clancy's the division 2 is an online action-shooter RPG experience, where exploration and player progression are essential. Nintendo 107777 - Play as fan-favorite characters like Ganondorf, Tetra, Skull Kid, and Ravio. Link and zelda can wear costumes from the Legend of Zelda: Breath of the Wild game. Contains all downloadable content from prior versions of the game. My fairy mode-now with detailed three-dimensional graphics-lets you befriend, raise, customize, and level up fairies you can take into battle. Fight alongside a friend in two-player mode on one system. Hyrule warriors: definitive edition - nintendo switchsystem requirements:supported platforms: Nintendo - Switch Nintendo account required for game activation and installation World war 2 as you've never seen it before - Take the fight to unexpected but crucial moments of the war, as Battlefield goes back to where it all began. Nintendo Switch Digital Code - Hyrule Warriors: Definitive Edition - Tom clancy's the division 2 is an online action-shooter RPG experience, where exploration and player progression are essential. Save a country on the brink of collapse as you explore an open, dynamic, and hostile world in Washington, DC. Fight together with your friends in online co-op or against others in competitive PvP. Square Enix US-E3-DC-2018-060518-025 - Darkness as Sora and his friends embark on a perilous adventure. My fairy mode-now with detailed three-dimensional graphics-lets you befriend, customize, raise, and level up fairies you can take into battle. Fight alongside a friend in two-player mode on one system. Features worlds based on new Disney properties including Tangled and Big Hero 6. Play as fan-favorite characters like Ganondorf, Tetra, Skull Kid, and Ravio. Download the game now play on Jan 28 9pm PST. Set in a vast array of disney and pixar worlds, KINGDOM HEARTS follows the journey of Sora, an unknowing heir to a spectacular power. Link and zelda can wear costumes from the Legend of Zelda: Breath of the Wild game. Kingdom Hearts III - PS4 Digital Code - Sora is joined by donald duck and Goofy to stop an evil force known as the Heartless from invading and overtaking the universe. Pre-order to receive the Dawn Till Dusk Keyblade DLC. Combines worlds of Disney and Final Fantasy. Sora returns with donald duck, Goofy, King Mickey and Riku to stop Master Xehanort's plan. Sora, donald, and goofy unite with iconic Disney-Pixar characters old and new to overcome tremendous challenges and persevere against the darkness threatening their worlds. System requirements: supported platforms: one - microsoft xbox Xbox account required for game activation and installation World war 2 as you've never seen it before - Take the fight to unexpected but crucial moments of the war, as Battlefield goes back to where it all began. 64-player multiplayer in the chaos of all-Out War - Lead your Company in all-out multiplayer with new experiences like the massive Grand Operations mode. Capcom - New "attraction Flow" attacks incorporate Disney Parks attractions. Hunt alone or in co-op with up to three other players, and use materials collected from fallen foes to craft new gear and take on even bigger, badder beasts!System Requirements:Supported OS: Windows 8 Windows 10 Steam account required for game activation and installation World war 2 as you've never seen it before - Take the fight to unexpected but crucial moments of the war, as Battlefield goes back to where it all began. Monster Hunter: World Online Game Code - Tom clancy's the division 2 is an online action-shooter RPG experience, where exploration and player progression are essential. Save a country on the brink of collapse as you explore an open, dynamic, and hostile world in Washington, DC. Fight together with your friends in online co-op or against others in competitive PvP. Choose a unique class specialization to take on the toughest challenges with friends in a genre-defining endgame. Want more? upgrade to the gold edition, featuring a Year 1 Pass with additional digital content and three-day early access to the game. The gold edition includes the base game, Year 1 Pass, and three-day early access to the game. - Contains all downloadable content from prior versions of the game. Link and zelda can wear costumes from the Legend of Zelda: Breath of the Wild game. Sora returns with donald duck, Goofy, King Mickey and Riku to stop Master Xehanort's plan. Play as fan-favorite characters like Ganondorf, Skull Kid, Tetra, and Ravio. Download the game now play on Jan 28 9pm PST. World war 2 as you've never seen it before - Take the fight to unexpected but crucial moments of the war, as Battlefield goes back to where it all began. 64-player multiplayer in the chaos of all-Out War - Lead your Company in all-out multiplayer with new experiences like the massive Grand Operations mode. Star Wars Resistance Season 1 - The most physical battlefield yet - Maneuver through the battlefield using a new soldier move set, fortifications, and mobile tools of destruction. Play untold war stories - Witness human drama set against global combat in the single player War Stories. Tom clancy's the division 2 is an online action-shooter RPG experience, where exploration and player progression are essential. - Storm through the jungle canopy of a hidden Rebel base on Yavin 4 with your fellow troopers, dispensing firepower from AT-STs. Link and zelda can wear costumes from the Legend of Zelda: Breath of the Wild game. Or rise as a new star wars hero – iden, an elite Imperial special forces soldier – and discover an emotional and gripping single-player story spanning thirty years. Star Wars Battlefront II Online Game Code - 1 compatible video card or equivalent online connection requirements: 512 kbPS or faster Internet connection Hard-drive space: 60GB World war 2 as you've never seen it before - Take the fight to unexpected but crucial moments of the war, as Battlefield goes back to where it all began. 64-player multiplayer in the chaos of all-Out War - Lead your Company in all-out multiplayer with new experiences like the massive Grand Operations mode. - Pay for games and services directly through Battle. NetBattle. Net balance is a different way to buy our digital products and services. Pre-order to receive the Dawn Till Dusk Keyblade DLC. Earn rewards, customize your troopers and heroes, and bring your upgrades with you on the online multiplayer battleground. Battle. Net registration required. Link and zelda can wear costumes from the Legend of Zelda: Breath of the Wild game. New "attraction Flow" attacks incorporate Disney Parks attractions. World war 2 as you've never seen it before - Take the fight to unexpected but crucial moments of the war, as Battlefield goes back to where it all began. Blizzard Entertainment Digital Code Online Game Code - $20 Battle.net Store Gift Card Balance - 64-player multiplayer in the chaos of all-Out War - Lead your Company in all-out multiplayer with new experiences like the massive Grand Operations mode. The most physical battlefield yet - Maneuver through the battlefield using a new soldier move set, fortifications, and mobile tools of destruction. Play untold war stories - Witness human drama set against global combat in the single player War Stories. Square Enix US-E3-2018-PC-SFTP-060918-001 - Huge south american world - 100 square kilometers to explore from rainforest to desert, and across snowy mountain peaks as you explore the world of Solis from bustling cities to rural grasslands. Features worlds based on new Disney properties including Tangled and Big Hero 6. Earn rewards, customize your troopers and heroes, and bring your upgrades with you on the online multiplayer battleground. Battle. Net registration required. Creative destruction at its best - customize your new grapple hook with evolved and new capabilities; Experiment with military jets, helicopters, turbo-fueled sports cars, and construction vehicles. Note: Battle. Net gift cards can only be redeemed into US registered user accounts. Just Cause 4 Online Game Code - Load up your battle. Net balance, in-game items, character services, then use it on Blizzard Entertainment games, and more. Battle. Net balance is simple and convenient to use. Use battle. Net balance to buy world of warcraft realm transfers and other paid services, as well as digital versions of Blizzard games like Diablo III and StarCraft II. You can also use battle.